The Texas State Capitol dominates the background of the round. The Capitol is pictured from an angle, with the south facade and its fluttering flags clearly visible. The dome is prominent in the tableau, the elegant arches and columns hoisting the statue of the Goddess of Liberty toward the top of the round. 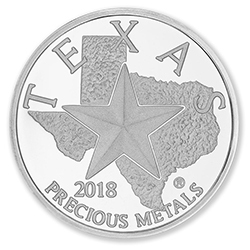 The Texas Silver Round’s specifications – “.9999 Silver • One Troy Oz” – are engraved over the Capitol, communicating the unique purity of this round only matched by select products from the Royal Canadian Mint and the Perth Mint of Australia. The trademarked silhouette of Texas mint mark, the official mint mark for the Texas Mint, is visible to the right of the bluebonnets. The weight and purity of the round are guaranteed. The Texas Silver Round can be purchased in a monster box produced exclusively for the Texas Mint. Packaged in 20 protective tubes of 25 rounds each, the monster box holds 500 1-ounce Texas Silver Rounds. Built from durable cold-rolled steel and finished with a matte black powder coat, the monster box lid features an orange cutout of the state of Texas. Each sealed monster box is secured with a unique serial number and a holographic seal to ensure maximum product protection. The box dimensions are 8.75 x 7 x 4 inches. The Texas Silver Round is also available to purchase in a similarly designed and secured mini-monster box, which contains 10 protective tubes of 25 rounds each for a total of 250 silver rounds. The mini box dimensions are 8.75 x 3.75 x 4 inches.